Maintenance free batteries usually start with the code CTX (e.g. 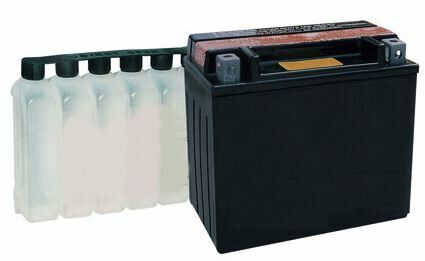 CTX9-BS) and often have the letters ‘BS’ on the end of the battery part number (the ‘BS’ part is used by most manufacturers to indicate that the battery is supplied with an acid bottle). The 1st letter of the battery code is a manufacturers letter and can be different depending on the battery manufacturer (so YTX12-BS, CTX12-BS, GTX12-BS, DTX12-BS, ETX12-BS etc are all the same battery). Maintenance free batteries normally have black case and a plastic strip pressed into the top. Please note – The power outputs stated on this page will vary depending on the make and quality of the battery! The information provided on this page is ‘to the best of our knowledge’ and should not be taken as 100% accurate!! To keep this page as a free resource for people to use, there are affiliate links (mainly Amazon) throughout the article. These affiliate links help maintain the cost of running this blog (basically, if you visit Amazon through one of the links and buy something, we make a few pence! ).